Medical students from the Faculty of Medicine at the University of Pretoria are making a difference among the less privileged communities in Pretoria and surrounding areas through their society, Jeans and Jerseys (Project JJ). 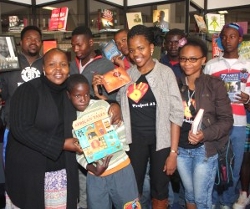 On 29 June the medical students donated books and launched a ‘readathon’ competition to a group of boys residing at Crossroads Boys Shelter at Salvokop, west of Pretoria. 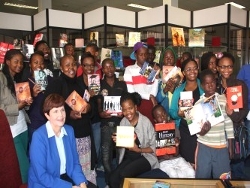 The book donations, which include biographies of South African leaders, were made possible by the University of Pretoria’s Library Services in conjunction with the USA Embassy. Project JJ is in line with the University of Pretoria’s community engagement commitment, established by medical students in 2006. This charity-based society is involved in various projects. The medical students offer tutorials to high school boys from the Crossroads Boys Shelter every second Saturday at the University’s Prinshof Medical Campus. The students also offer assistance by donating clothing, food and basic necessities to the Tshwaraganang Orphanage in Hammanskraal, and to a crèche in an informal settlement near Laudium, west of Pretoria. A social worker at the Crossroads Boys Shelter, Maureen Mokhara, welcomed the book donations, which will assist the boys with their developmental programme. She also lauded Project JJ for their endeavours in ensuring that the boys enjoy and improve upon their school work. “These children are mostly taken from the streets of Pretoria and are usually placed back in schools. Since our boys started to interact with Project JJ’s tutorials, we have noticed an improvement in their pass rate. These books will also make an improvement in their school work, especially with regards to reading and comprehension,” she said. 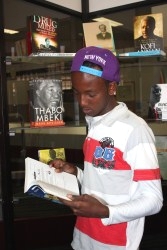 Books covering a range of social topics, and also about the lives of prominent South African leaders welcomed by the boys and staff from Crossroads Boys Shelter.